CT's repeat flood damage dilemma: move out or rebuild? Laurie Robinson’s home in Milford. The kitchen is at the top of the stairs. When storm Sandy dumped nine feet of water in Laurie Robinson’s house in Milford three years ago, the repairs were barely finished from the six feet of water Tropical Storm Irene had dumped 14 months earlier. Now her kitchen sits 15½ feet up at the end of 19 steps it takes to get to Robinson’s front door. 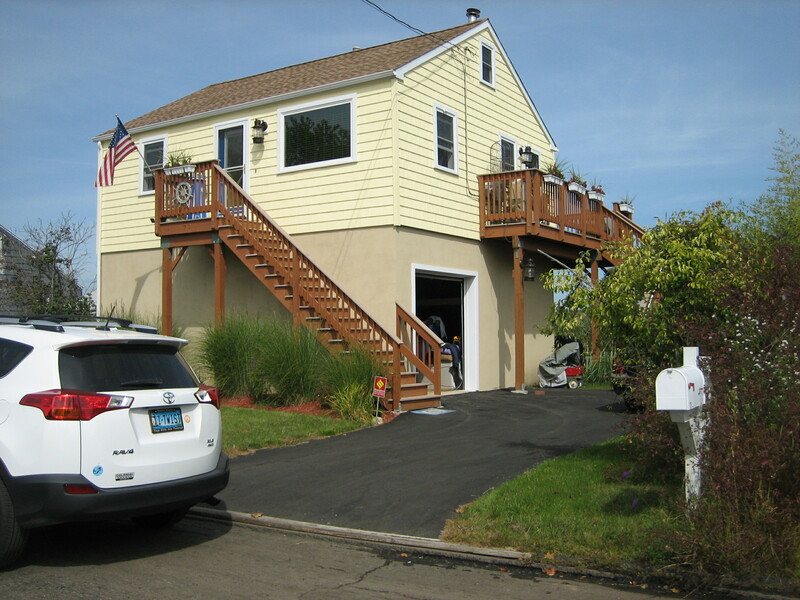 The house at the end of Cooper Avenue offers a better view than the old ground-level one did of Long Island Sound one long block away, as well as of neighboring Silver Sands State Park and the surrounding salt marsh. It also offers Robinson a sense of safety. Which is why, even after the two major floods and their accompanying damage, not to mention a previous flood from a nor’easter in December 1992, Robinson never considered leaving. She has a lot of company. 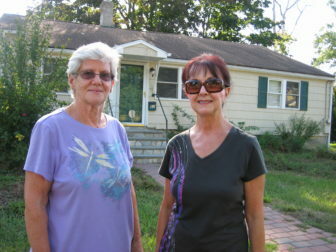 Throughout Connecticut, thousands of homes have suffered what Robinson, and most of her Cooper Avenue neighbors have suffered: repetitive loss, as the Federal Emergency Management Agency calls it, from flooding. Many, like Robinson, have rebuilt multiple times. 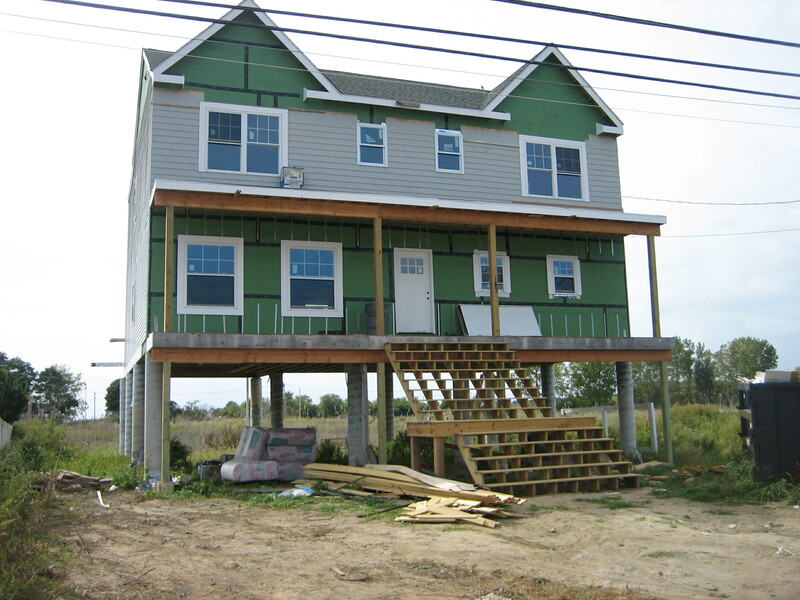 Many have elevated their homes because they want to or have to. Robinson went a step further, tearing down her old house and building a new one. And many, also like Robinson, have used government funds from an alphabet soup of federal programs and agencies to do some, if not all, of the work. 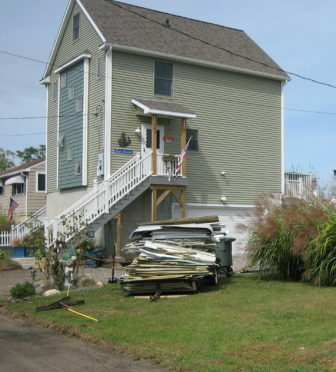 But shoreline and climate experts, public officials and others have grown increasingly critical of such programs, including the National Flood Insurance and Hazard Mitigation Grant Programs, arguing that they encourage rebuilding in places that have already shown themselves to be flood-prone and are likely to become more so because of climate change and its associated sea level rise. And so those same people are starting to question using public funds to rebuild repetitive loss properties over and over. The worry is that despite all the money poured in, any number of these coastal areas may become uninhabitable in the not-too-distant future anyway, leaving homes like Robinson’s and her neighbors literally high and dry, but in the water permanently. The gnarly question is whether the time has come to more regularly consider a more drastic response: not rebuilding. Some wonder if the better use for public dollars would be for buyouts, thereby abandoning shoreline development to nature. But buyouts in Connecticut have been glaringly unpopular – chosen by an infinitesimal fraction of property-owners who have suffered repetitive losses. It’s no surprise to Rob Young, director of the Program for the Study of Developed Shorelines at Western Carolina University, who has looked at these sorts of situations around the world. The reason, he said – there was no risk in doing that. Through five storms — a March 2010 flood, a January 2011 winter storm, Irene, the October 2011 snowstorm and Sandy — there have been 43 FEMA buyouts approved in Connecticut. Fewer than 20 percent have been on the shoreline. The rest have been on inland waterways. By contrast, in Vermont, where the remnants of Irene caused massive flooding, there have been 126 FEMA buyouts. A conservation easement sign in West Haven along Old Field Creek beyond the trees in the background. The Natural Resources Conservation Service, a division of the U.S. Department of Agriculture, runs a floodplain easement program that operates like a buyout when homes are involved. NRCS refused to disclose the number of properties and communities participating, but the program regulations typically exclude the immediate shoreline. West Haven is believed to be the prime participant in Connecticut with 32 properties approved for easements in the Old Field Creek floodplain a few blocks from Long Island Sound. Statewide buyouts are a drop in the bucket – pun intended – compared to the number of properties damaged repeatedly in recent years. Some lay the blame for that discrepancy squarely on shoreline municipal leaders who are thought to be loathe to give up the hefty property taxes on waterside and water-view properties – often also the riskiest locations. Figuring out how much public money has been used to rebuild on risky locations is next to impossible, but there are some useful indicators. As of the end of July, Connecticut had nearly 9,700 flood insurance claims on nearly 3,400 properties that FEMA considered repetitive losses. That means the properties had two or more claims of more than $1,000 within any rolling 10-year period since 1978. Of those, 186 properties accounted for 1,136 severe repetitive losses – properties with four or more separate flood insurance claims with the amount of each claim exceeding $5,000 and with the cumulative amount of the claim payments exceeding $20,000. These statistics, however, likely dramatically under-report repetitive flooding. The statistics are based on claims by property-owners who carry flood insurance and it’s widely thought that many shoreline and inland waterway properties in Connecticut do not. So even if they have had multiple incidents, they would not be included in the statistics. Milford is the dubious repetitive loss winner with 1,626 claims on 551 properties. Next is East Haven with half as many — 829 claims on 240 properties. The order flips with severe repetitive loss. East Haven has 202 claims on 27 properties and Milford has 176 claims on 32 properties. But asked whether some of those homes should be abandoned, he avoided a direct response. And so far in Milford, all but six have – and even those acquisitions aren’t complete. By contrast, $9.8 million in federal funds has been used in the state for FEMA buyouts, which will pay for up to 75 percent of a property’s appraised value. A $4 million state bond fund to help cover the remaining 25 percent has so far spent only $660,000. 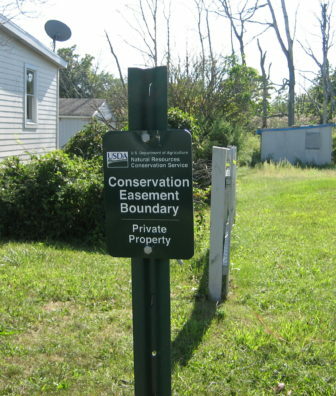 NRCS has approved more than $13 million for easements in Connecticut, more than half of which is to purchase homes in West Haven that have habitually flooded. In Milford, Laurie Robinson has received block grants as well as insurance. In all likelihood her home is considered an official repetitive loss property. Mark Elias’s home in Milford, now elevated 15 feet. The same goes for Mark Elias, who lives two doors closer to the water. He made an insurance claim for repairs after Irene emptied six inches of water into his ground-level cottage. He moved back in not long before Sandy. His home is now elevated to 15 feet. He, too, never considered leaving. But another neighbor, Donna Jackson, did think about it after Irene flooded her. But she stayed. 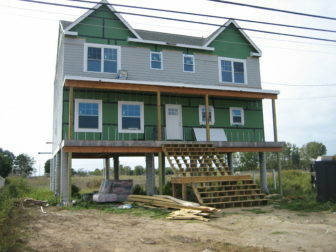 “Sandy destroyed our foundation and we were without a home for the first time in 36 years,” she said. The tsunami of elevation jobs has been a boon for home-lifting contractors like Clay Markham of High Caliber Contracting. Prior to the storms, he said about one percent of his work was funded by government grants. Now he said, it’s about 90 percent. About 90 percent of Clay Markham’s home lifting business is paid for now with government funds. Short term, he thinks elevating will take care of the problem. But even he questions its long-term wisdom. These days Sharie Roy can get pretty far into a conversation before her eyes well up and her voice quavers. This particular day -– the kind she originally moved to the West Haven shore for — she stands in front of the home she no longer lives in along Old Field Creek. Its chimney is crumbling; the foundation is sinking. In a matter of months it will be gone – bought out through an NRCS floodplain easement and demolished. The land it is on will never again be developed. Connie Eberle, left, and Sharie Roy. “It’s very sad to see it go,” she says of her neighborhood, as her friend Connie Eberle, who also took the buyout, concurs. “When I start getting those down days, those sad days, I think about those moments I saw that tidal surge come up the shore and swallow my car. That straightens me right out,” Roy says. 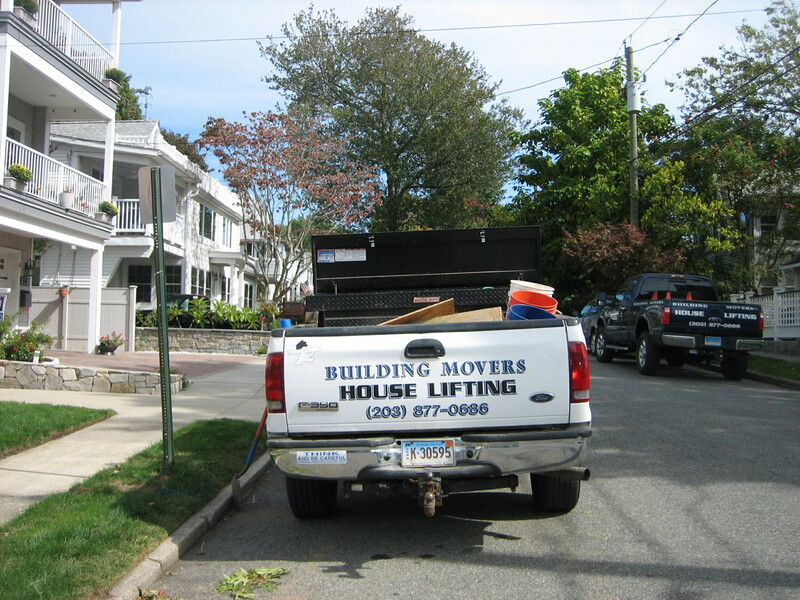 West Haven is the only shoreline community that has opted for broad-scale buyouts. The plan was already in motion when Mayor Edward O’Brien took office. He recalled growing up in that neighborhood, seeing the marshland flooding repeatedly. Roy and Eberle agreed there’s a lesson in West Haven. “I hope it’s a wake-up call to the shoreline communities,” Roy said. The only other municipality embracing buyouts has been Plainville – decidedly not on the coast – with more than 20 along the Pequabuck River. FEMA is supplying about $3.2 million. Doing a quick estimate of the tax loss, which he said he’d never even bothered to calculate, he comes up with $84,000 a year. “That’s chump change on a $56 million budget. The story in East Haven has gone differently. While the city has opted for buyouts along a Farm River stretch far from the Long Island Sound shoreline, the beachside homes that flooded in Irene and again in Sandy -– some to the point of total destruction –- are largely just being elevated as they are rebuilt. East Haven has the most repetitive loss of any municipality in the state. “A couple of lists I’d rather not be at the top of,” said fire Chief Douglas Jackson, who is also in charge of emergency management. He admitted there are probably some cases where properties should be bought out. But State Senate Minority Leader Len Fasano, R-North Haven, is not so sure. He’s seen the issue as a lawmaker -– he represents the badly battered East Haven shoreline — and as a shoreline home and business owner. His beach club was clobbered in both Irene and Sandy. He tapped flood insurance both times, probably putting him on the repetitive loss list. His home next door is elevated and had minimal damage. He said in the 35 years he’s owned the house, he’s never made a flood insurance claim and recently cancelled it when the rates went up dramatically. His parents’ home, next to his, has never had a claim since they moved in in 1958. Fasano argues that while Connecticut had a rash of flood insurance claims from Irene and Sandy, other parts of the country have more sustained repetitive losses. “I don’t think you should point to Irene and Sandy and say ‘Aha, here’s our moment to talk about climate change and acquisitions of property so we don’t have repetitive loss.’ I think that’s a dangerous road,” he said, suggesting there’s more regular flooding along the Mississippi River than in East Haven or Milford. U.S. Rep. Rosa DeLauro, D-Conn., whose district includes both East Haven and Milford, and who has fought to keep flood insurance rates low and therefore the shoreline more accessible to buyers, did not exactly disagree. An elevated home on Milford’s Cooper Avenue. The salt marsh and Silver Sands State Park are visible in the background. The stronger storms seem to get even stronger as the ocean warms, and just a small amount of sea level rise can result in much more frequent coastal flooding. That puts even more coastal property and infrastructure at risk, further begging the question of whether rebuilding is wise. “You can make a compelling argument that we should err on the side of being risk averse given what’s at stake, “Horton said. “A lot of the flood zone management policies were designed for climate of the past. And Study of Developed Shorelines director Young would like to see some policy changes as well. For starters, people putting “more skin in the game” — having to pay more of the cost of living in a vulnerable area. He said there should be limits on the use of public funds for those repeatedly flooded out, and that should include not insuring anything other than primary residences. No vacation homes. The transition to that, he said, has to be gradual. Fast or slow, it’s what has Connecticut officials a bit stumped. He offers a “maybe” to the question of whether there’s a way to convince coastal homeowners it’s time to go. First, he and others said – a real threat assessment is needed to understand where the biggest vulnerabilities are. But he said, skip those million-dollar shoreline mansions and start with the more modest homes beyond them. Others have suggested another key lies in changing local zoning regulations. 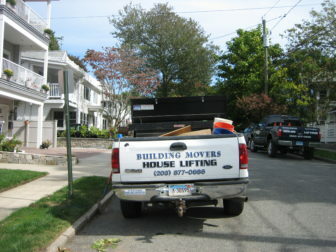 Equally important is providing diversified housing stock so people considering moves off the shoreline will have options. April Capone is manager of intergovernmental affairs in the state Office of Policy and Management. Her focus lately has been resilience policy and planning, but she learned it all the hard way. She was mayor of East Haven when Irene flattened Cosey Beach. But there are no magic bullets, she said. And buyouts can have unintended consequences. “Solutions have to be varied and they have to be incremental, and they have to happen over time,” she said. But changing the mindset of how or whether to live on the shoreline: “Not overnight,” she said. Only a few dozen property owners have opted for buyouts through FEMA in the last several years. Most of them are inland, not along the shoreline. A floodplain easement program that operates like a buyout through the Natural Resources Conservation Service within the U.S. Department of Agriculture also is available. About 30 homeowners in West Haven are participating in that. Andrew Ba Tran prepared the graphics in this story.